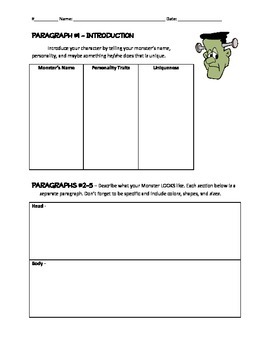 This is the graphic organizer to a Halloween writing activity that has students creating their own monster and producing a descriptive informational writing with multiple paragraphs. For the activity, students draw their own monsters in secret being sure no one else sees what their monster looks like. 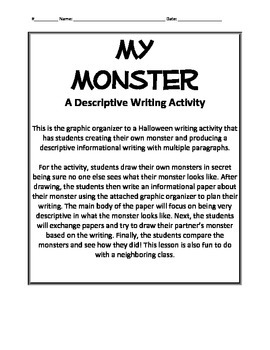 After drawing, the students then write an informational paper about their monster using the attached graphic organizer to plan their writing. The main body of the paper will focus on being very descriptive in what the monster looks like. 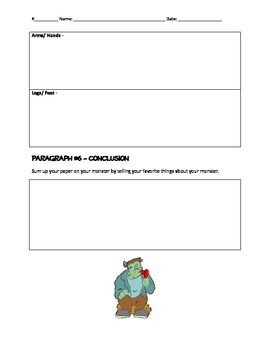 Next, the students will exchange papers and try to draw their partner’s monster based on the writing. Finally, the students compare the monsters and see how they did! This lesson is also fun to do with a neighboring class.